This week we had the absolute delight of being invited to Warrington Parr Hall to watch The Snowman Tour, something that I had seen advertised last year and thought sounded amazing. 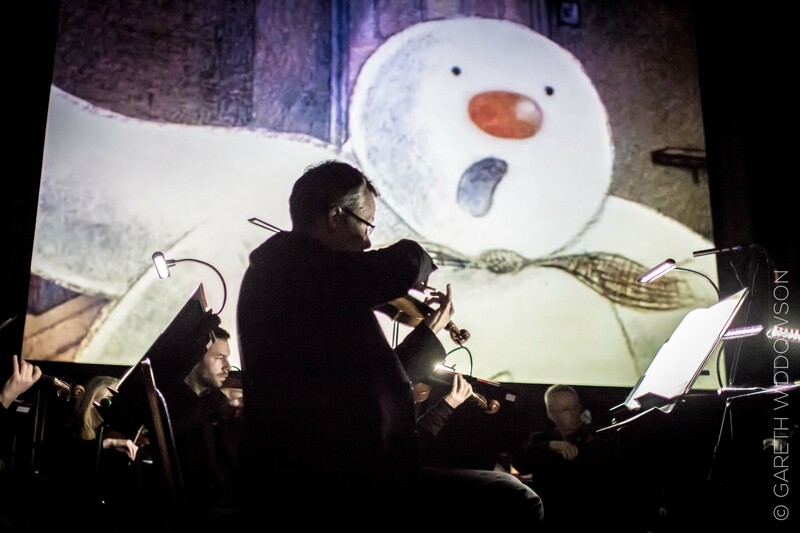 The Snowman Tour has been created by Carrot Productions and showcases the amazingly talented musicians of The Picture House Orchestra and is conducted by the BBC Symphony Orchestra’s Steve Magee, an expert in syncing music to film with split second precision. The tour has been to 16 different venues across the country and as we had never been to Warrington Parr Hall before, despite it only being about 20 minutes from us, we were excited to take a look inside. The venue is lovely and was surprising small which I always find as a bonus as it makes the performances seem more intimate. We were very lucky and had seats near the front but having had a quick look around it also looked like every seat in the house offered a good view. We will certainly be checking out what else is showing at Warrington Parr Hall in the new year. The story of The Snowman is one that is well known by most and loved by all yet it never seems to get old with it’s heart warming tale of a little boy who makes friends with his snowman and I couldn’t wait to experience it with a live orchestra, although I was unsure what the children would make of it. Once we were seated the musicians entered followed by the conductor and instead of going straight into The Snowman they started with a medley of festive songs that had us tapping our feet and naming the songs as they went along. This was a brilliant way to get everyone in a Christmas mood and immediately made us realise what a treat we were in for as the music was just amazing. From here the very talented double bass player talked us through a hilarious tale from the last time he was on tour which was accompanied of course by live music and well timed sound effects, which had both adults and children engaged and laughing from star to finish and wanting to know whether they made it to the performance on time or not. Once this story was over it was time for the bear and the piano, a tale of music, friendship and adventure. story that I wasn’t familiar with but thoroughly enjoyed and thought had a beautiful message to offer the audience. This ended the first half which must have lasted about an hour but felt a lot less and it was now time fora quick break and a visit from The Snowman himself which the children enjoyed. After the interval the orchestra reappeared and it was time for the main event. The Snowman was shown on a big screen and the music that was played along side was just beautiful. There was also an extra surprise for me that I wasn’t expecting and that was that a young lady stepped to the front of the stage and as The Snowman took to the sky she performed a wonderful solo of Walking in the air. It was an incredible performance and one I am sure will lead to great things for her. The entire evening was captivating from start to finish and my eldest son who is 8 repeatedly told me how incredible it was and how much he enjoyed it. It was the perfect way to introduce them to live music and orchestras. If you, like I did, have any concerns that a live orchestra performance sounds more adult than child friendly then let me assure you that this performance if defiantly child friendly too. From the funny tale, to the animations and the appearance of the snowman himself it is every bit as much for children as it is for adults and is a most magical and festive experience which will be treasured for years to come. There are still performances of Carrot Products The Snowman left on the 2018 tour at Beverely Minister, Durham Cathedral and Liverpool Cathedral until the 29th December but if you unable to make these dates now then keep your eyes peeled for the 2019 dates and make next Christmas extra special.